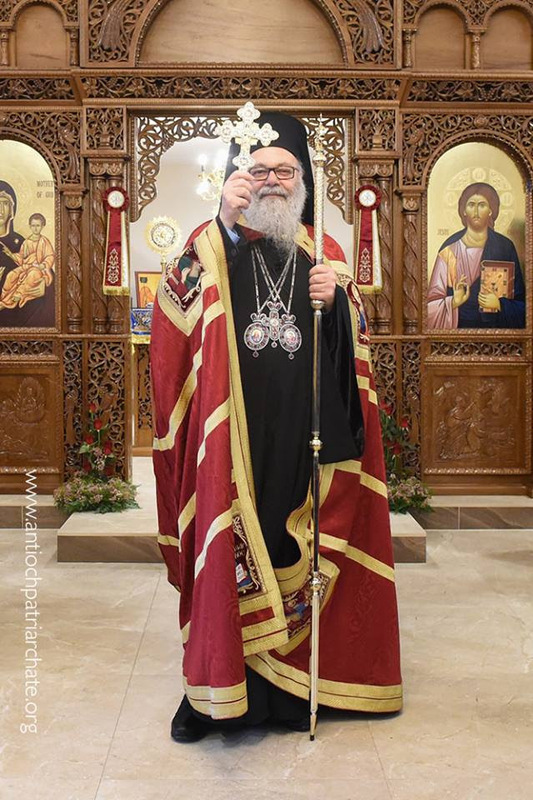 Meet the new Metropolitan Archbishop of the Antiochian Archdiocese of Australia, New Zealand and the Philippines, His Eminence, the Most Reverend Metropolitan Basilios (Kodseie). Metropolitan Basilios was elected by the Holy Synod of Antioch to the Archdiocese of Australia, New Zealand and the Philippines on 4 October 2017, and was ordained as Metropolitan Archbishop at the Lady of Balamand Cathedral, Lebanon, on 19 November 2017. 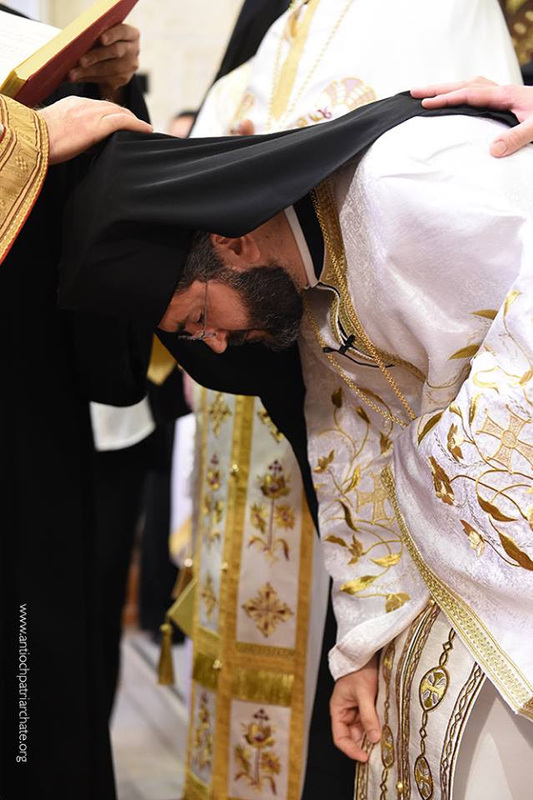 Ordination of Metropolitan Basilios in Our Lady Balamand Cathedral, Lebanon, on 19 November 2017. 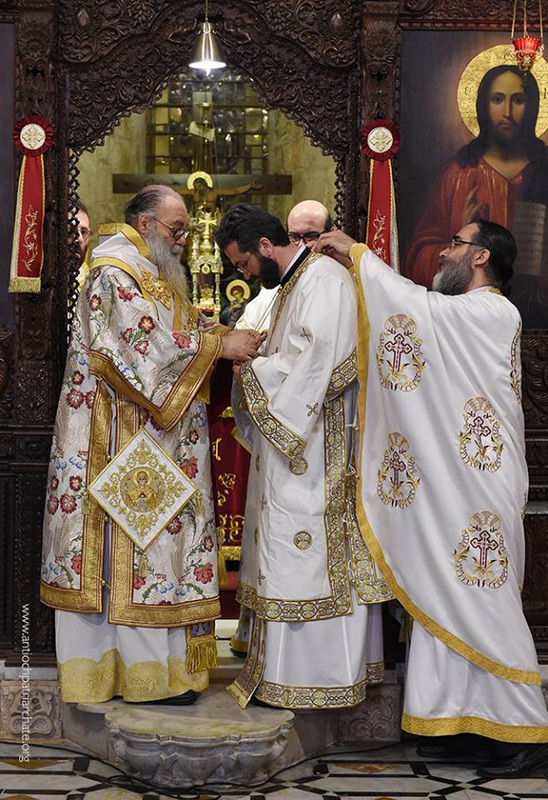 Patriarch of Antioch John X enrobing Metropolitan Basilios at his ordination. 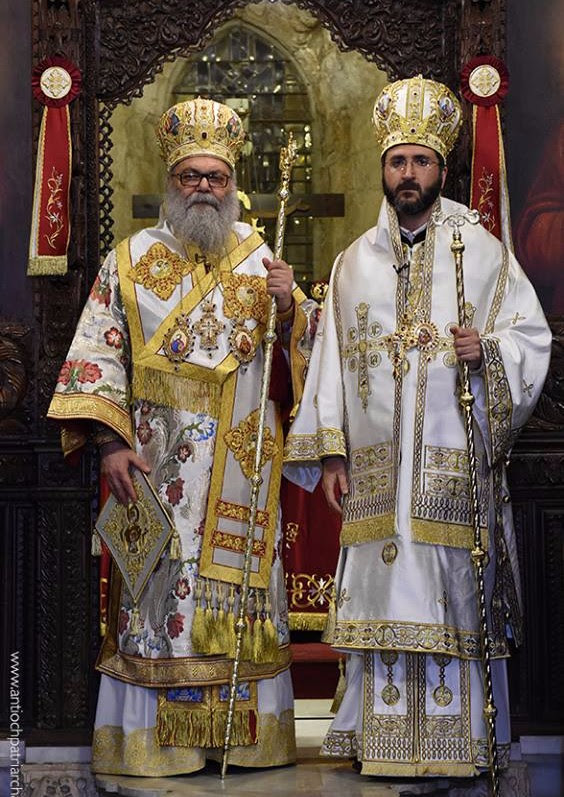 Newly ordained Metropolitan Basilios standing alongside His Beatitude, John X, Patriarch of Antioch and All the East. He was enthroned as Metropolitan Archbishop of the Antiochian Archdiocese of Australia, New Zealand and the Philippines at the Cathedral of St. George in Redfern, Sydney, on 16 December 2017. Patriarch John X and Metropolitan Basilios with Antiochian Clergy on the day of Metropolitan Basilios’ enthronement in Sydney. Members of The Good Shepherd Orthodox Church had the great privilege of meeting our new Metropolitan when he visited Melbourne on 19–20 December, 2017. Members of The Good Shepherd Orthodox Church with Metropolitan Basilios and Antiochian Clergy at the Patriarchal Reception following Vespers on 20 December 2017. Metropolitan Basilios was accompanied on this trip by His Beatitude, John X, Patriarch of Antioch and All the East. Members of The Good Shepherd had the privilege of attending Matins, Divine Liturgy and Vespers with both our Patriarch and our newly enthroned Metropolitan Archbishop. His Beatitude, John X, Patriarch of Antioch and All the East, at St. Paul’s Orthodox Church, Dandenong, on 20 December 2017. Metropolitan Basilios was born in Latakia where he studied engineering at the Teshreen University, from where he graduated in 1999 with a Bachelor’s Degree in Electrical Engineering. He continued his higher education in St. John of Damascus institute of theology at the University of Balamand (Lebanon), graduating with a Master’s Degree in Theology in 2003. He went on to continue his theological education in Greece, at the Aristotle University of Thessaloniki, within the Department of Pastoral Care and Christian Ethics, where in 2008 he graduated with a Doctorate (Ph.D.) in Theology. He was ordained to the Diaconate in 2003 and to the holy priesthood in 2005, with the rank of Archimandrite, by Metropolitan Paul (Yazigi) of Aleppo, Alexandretta, and Dependencies, where he served as the Archdiocese Vicar until 2010. He arrived in Australia in April 2010, where he served as hierarchical assistant to His Eminence, the late Metropolitan Paul Saliba of Thrice-Blessed Memory. Since 2012, he has served as parish priest of St. Mary’s Mt. Pritchard Parish, transforming their youth and adult education programs. In 2012, he founded the St. Raphael Antiochian Mission, a philanthropic body that services the needs of Sydney’s homeless, specifically serving food, clothing and social support on a weekly basis and during major holidays. He is a trained volunteer in palliative care via the Calvary Hospital and has continued formal training in counselling and community welfare, completing several courses through the University of Sydney’s Centre for Continuing Education, as well as through the Centre for Community Welfare Training (CCWT). Within Australia, he has lectured at several theological and pastoral conferences and symposiums, and from 2010, he has served as chief lecturer at St. Paul Theology School of the Antiochian Archdiocese, also appearing as a guest lecturer at St. Cyril’s Coptic Orthodox Theological College. In 2016, he obtained his teaching accreditation from Australia’s leading Orthodox seminary, St. Andrew’s Greek Orthodox Theological College. In January 2016, he received his Australian Citizenship. In 2017, following the repose of His Eminence, Metropolitan Paul Saliba, of Thrice-Blessed Memory, he was appointed as Patriarchal Vicar, serving until his recent election as Metropolitan of the Antiochian Archdiocese of Australia, New Zealand and the Philippines. He was consecrated to the Holy Episcopacy on November 19th, 2017 at the Lady of Balamand, Lebanon. He was enthroned within the Antiochian Archdiocese of Australia, New Zealand and the Philippines on December 16th, 2017 at the Cathedral of St. George in Redfern, Sydney. He speaks Arabic, English and Greek. His name day is 1st of January (St. Basil the Great). What is the role of the clergy in the Orthodox Church? The Orthodox believe that Christ is the only priest, pastor, and teacher of the Christian Church. He alone forgives sins and offers communion with God, his Father. Christ alone guides and rules his people. Christ remains with His Church as its living and unique head. Christ remains present and active in the Church through the Holy Spirit. Through the sacrament of holy orders bishops give order to the Church. Bishops guarantee the continuity and unity of the Church from age to age and from place to place, that is, from the time of Christ and the apostles until the establishment of God's Kingdom in eternity. Bishops receive the gift of the Holy Spirit to manifest Christ in the Spirit to men. Bishops are neither vicars, substitutes, nor representatives of Christ. It is Christ, through His chosen ministers, Who acts as teacher, good shepherd, forgiver, and healer. It is Christ remitting sins, and curing the physical, mental, and spiritual ills of mankind. This is a mystery of the Church. The clergy are servants of Christ and His people, and are considered as members of the congregation, not a special privileged class. A bishop is the successor to the Apostles in the service and government of the Church. The bishop serves as a type of Christ in the Church. No bishop in Orthodoxy is considered infallible. None has any authority over or apart from his priests, deacons, and people or the other bishops. They have the responsibility of maintaining the unity of the Church throughout the world by ensuring the truth and unity of the faith and practice of their diocese. The bishop represents his particular diocese to other churches or dioceses, and represents the Universal Church to his own particular priests, deacons, and people. From about the sixth century, it has been the rule that bishops are single men or widowers. Bishops are also usually in at least the first degree of monastic orders. What is a Metropolitan Archbishop? Sacramentally, all bishops are equal. Nevertheless, there are distinctions of administrative rank among bishops. The Antiochian Orthodox Church may grant the administrative status of a Metropolitan Archbishop to a senior bishop, usually one who is in charge of a large ecclesiastical jurisdiction. Patriarch is a title reserved for the Primate of autocephalous Orthodox churches. The title Patriarch was first applied to the original three major sees of Rome, Alexandria, and Antioch, and shortly after extended to include Constantinople and Jerusalem. The Patriarch of Antioch and All the East presides over the Holy Synod of the Antiochian Orthodox Church, and represents the Antiochian Orthodox Church within the fifteen separate autocephalous hierarchical churches that comprise the One, Holy, Catholic and Apostolic Church. Listen to the then Archimandrite Basilios Introduce the Philokalia, a presentation of the Orthodox therapeutic method for spiritual healing.